We then see Asajj Ventress taking out the bounty on Savage Oppress in some bar, with her heading towards Raydonia. Then, Savage Oppress jumps behind him and starts fighting him. The three of them engage in fighting until they knock Obi-Wan Kenobi out, and bring him onto their ship. We then see Asajj Ventress make her way to Raydonia, then hops onto their departing ship. Meanwhile, we see Savage Oppress and Darth Maul roughing up Obi-Wan Kenobi. 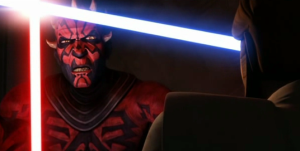 As to why they don’t just kill him, Darth Maul tells Obi-Wan Kenobi: “I will make sure you stay awake long enough to feel every single cut; your death will be beyond excruciating – you will suffer as I have suffered.” Clearly, Darth Maul is not interested in merely ending Obi-Wan’s life – he wants to make it long, painful, and suffering. Before Darth Maul fully engage in such an action against Obi-Wan Kenobi, Asajj Ventress shows up to take on Savage Oppress, making it a two versus two fight. This fight becomes a pretty notable fight within Star Wars: The Clone Wars series, since 1) Asajj Ventress seems to pop up out of nowhere and become Obi-Wan’s ally, 2) this is quite a match-up on both sides, and 3) Darth Maul and Savage Oppress seem to be dominating them. He definitely is trying to rub it in to Obi-Wan and to raise his ire, which works, as he points out to Obi-Wan Kenobi: “Your rage has unbalanced you; that is not the Jedi way, is it?” This latter line shows not only that Obi-Wan Kenobi has become a bit unhinged and un-Jedi-ish (not so dissimilar to what happens with Obi-Wan Kenobi when he fights Darth Maul in “The Phantom Menace”). It also indicates that Darth Maul is well aware enough of Obi-Wan Kenobi such that he is able to detect his lack of balance with the Force. Darth Maul is not only patient enough to not immediately pursue them, but also expecting the Jedi to come after them! It is in this fashion in which the fourth season of Star Wars: The Clone Wars concludes.